ALPHA OMEGA Management is extremely delighted to announce that ELLEFSON MUSIC PRODUCTIONS (aka EMP Label Group) and ALPHA OMEGA Management have merged forces for a two-way partnership! ALPHA OMEGA Management enters EMP Label Group creating a new sub-label for upcoming artists, and, furthermore DAVID ELLEFSON (MEGADETH bassist and founder of EMP Label Group) and THOM HAZAERT (Artist Manager, Music and Film Producer, A&R Director, Operations Manager at EMP Label Group) enter ALPHA OMEGA Management, to form a global partnership for management and booking. *** DAVID ELLEFSON has no need for long introductions, as an original member of MEGADETH, credited as one of the thrash metal’s “big four” with Anthrax, Metallica and Slayer. David Ellefson is known for his unique, hard-hitting style of bass playing and unwavering dedication to his musical craft. David has engraved a vast musical hallmark as a bassist, songwriter, record producer, clinician and author. Together with MEGADETH, he has been awarded 10 Grammy nominations, countless gold & platinum records, plus continued recording & world concert tour activity. Ellefson holds a Bachelor’s degree in business marketing and continues to lecture on a variety of music and business related topics. Additionally, David is a prolific author with his titles: “Making Music Your Business… A Guide For Young Musicians”, “UNSUNG Words & Images” and “My Life With Deth”. Among his many accomplishments, Ellefson’s latest triumph is Ellefson Music Productions/EMP Label Group, the record label and production company formed in 2015, with industry exec Thom Hazaert tapped by Ellefson to oversee operations. With a diverse Rock and Metal Roster including Cage9, Another Lost Year, Ancient, Solus Deus, Doll Skin, and many more, EMP has quickly become a dominating force in the World of Hard Rock and Metal. *** THOM HAZAERT is a music business staple, known for a career spanning over 20 years, as an Executive, Journalist, Radio Personality, Artist Manager, Music and Film Producer, and most recently, the man behind the curtain at Ellefson’s EMP Label Group. Hazaert’s marketing work was influential in the early advent of lifestyle street and viral marketing among Rock acts, as an independent consultant for record labels including Flip Records, Interscope Records, Warner Bros. Records, Hollywood Records, Jive Records, and as co-founder of Total Assault Street Teams, working with hard-hitting artists including Staind, Cold, Limp Bizkit, Korn, Bloodhound Gang, Static-X, Nine Inch Nails, Filter, American Head Charge, and many more. Hazaert was co-founder and President of Corporate Punishment Records, and more recently, THC : MUSIC, a management firm and label, now an imprint of EMP. In the early 2000s, Hazaert went on to manage and develop major label artists, including Chimaira (Roadrunner Records), Erase The Grey (Universal Records), Switched (Immortal Records), and Depswa (Geffen Records). Additionally, he has listed Management credits in albums by MOTORHEAD (Hammered) and Earth Crisis (Last of the Sane) and is credited with helping to discover some of the World’s biggest contemporary Rock and Metal acts. Also a noted Radio Personality, Hazaert currently hosts “AM/PM with Thöm Hazaërt”, a 2 hour “late night morning show” airing on Dash Radio Metal and Punk station Los Anarchy Radio, focused on Hard Rock/Metal and Pop Culture. Each show begins with a segment called “Mandatory Megadeth”, a block of Megadeth songs that features Megadeth bassist David Ellefson telling the stories behind classic Megadeth tracks. *** ALPHA OMEGA Management features a new international team, composed by professionals, working in various sectors of the music industry, including ALEX AZZALI, internationally well-known producer, tour manager and or sound engineer (for Ancient, Behemoth, Dismember, Grave, Septicflesh, Rotting Christ, Cro Mags, Marduk, Hate, Vader and many more), NICK BARKER (drummer of Cradle of Filth, Dimmu Borgir, Lock Up, Brujeria, Benediction, Testament, Gorgoroth, Ancient, among the others) and Legendary Audio Engineer and Producer, BILL METOYER (Producer of Slayer, W.A.S.P, D.R.I, Corrosion of Conformity, Fates Warning, Helstar, Omen, Thrust etc. and ex Vice President of Metal Blade USA). 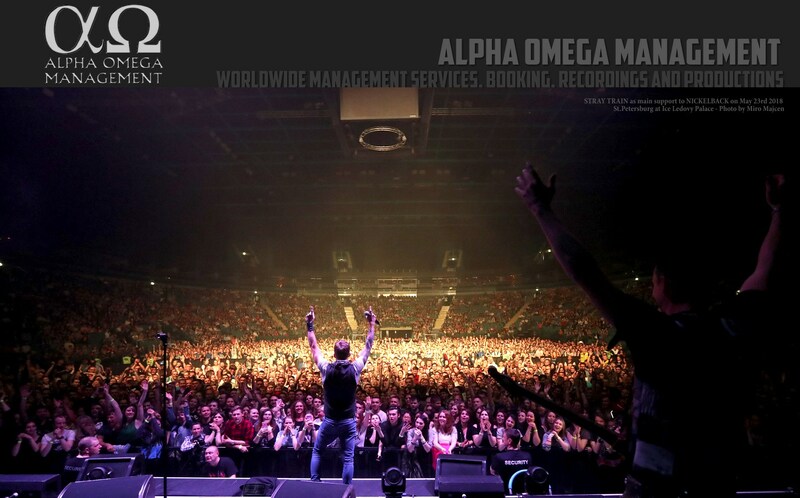 The visionaries of ALPHA OMEGA have created the new era for band management and worldwide booking for shows, tours and festivals. Constantly growing ALPHA OMEGA band roster consists of well established acts such as COVEN – VENOM INC – M:PIRE OF EVIL – ANCIENT – MALEVOLENT CREATION – EXTREMA – HELSTAR – OMEN – MASTER – MOBILE DEATHCAMP – NOCTEM – THRUST – KULT OV AZAZEL – TRAUMA – THEATRES DES VAMPIRES among quite a few amazing up and coming bands. ALPHA OMEGA also has a Residential Recording Studio at the Lake of Como, in close proximity to three major airports of Milan. Alpha Omega Recording Studio offers recording, mixing and mastering. Next postALPHA OMEGA TOURS is Born!